What is a great way to make sizeable profit without putting hardly any of your own money at risk? Four words: wholesaling lease options investing aka wholesaling. It’s not for everyone, but if you enjoy turning a deal, have nerves of steel and a good eye for profitable properties, it may be just your niche. If you enjoy turning great deals over to others without investing in them yourself on a large scale, then wholesale lease options investing can be a nice way to make a living. Wholesaling does not require a real estate license, so don’t worry about having to take special courses to enter the field. The reason that you don’t need a license is because you will have an equitable interest (option)in any property that you buy or sell. The interest can either be contractual (you have a property under contract) or actual (you own the property or have a title to it). 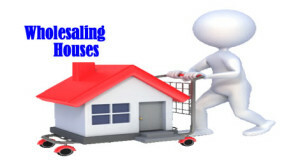 Wholesaling is basically getting a contract on a property (often a distressed one) and immediately re-selling it to another retail investor who can pay cash, obtain credit, or can purchase with a hard money loan. The key is getting a quick closing on the property. A wholesaler normally never buys a property; s/he simply enters into contracts for properties with contingencies built in. You want to sell for more than you paid. If you are unable to sell quickly and are expected to close on the deal, you can usually call in your contingency and walk away from the contract. A wholesaler is primarily a middleman service for a retail investor to use to find properties that have potential at rock-bottom prices. Finding bargains is the key! Price is the key to winning at wholesale lease options investing. You have to sell properties at prices where they will move so that you are not left holding the bag. That means that you need to find bargain properties that often need some work, and you also need to have a solid network of retail investors, as you are providing a middleman service, who will consistently buy from you. It might take a bit of time to build up your reputation and construct a network of buyers, but once retail investors trust you, they will buy often from you. Your initial investment in any homes that you are trying to sell quickly should be minimal—the costs of taking out a contract on a property, your time spent looking around for properties and negotiating settlements for them, plus any marketing that you might do. Truly, the start-up investment is miniscule. As you get to know your market and familiarize yourself with what investors want in a property, your abilities to make money will greatly increase. If you can keep your cash flow rolling, you can continue to “buy” and sell, “buy” and sell. The key is generating quick cash so that you can draw on great opportunities. Experts on wholesale lease options investing recommend that you work out at least a half dozen wholesale deals before you plunk down money on a steal that you’re excited about. The reason is that you do not want to plug your cash flow, and you also need to gain a lot of experience about the real estate market before you take the plunge and buy a place for yourself to turn around. Don’t worry. The time will come for you to re-make a run-down house into a palace as you make a profit on the first six deals that you engineer. In a way, wholesaling is a bit like being a baker. No baker will make a lot of money if s/he continues to eat all of his/her best products. It’s also like being a passer in a given sport; you enjoy distributing good deals to others, not hogging them for yourself. In essence, you can look but not touch as you spy out properties with a future, put a contract on them and then sell—quickly—to an investor that has the means necessary to amass several properties and rent them out. In time, you will find a steal that you have to capitalize on, but in the meantime keep relaying the great deals, provide an excellent middleman service, and become a trusted seller in this new market. © 2012 to 3633 Critical Financial. All rights reserved.